The BlackBerry Bold is Research In Motion's first HSDPA 3G phone, and as a result, consumers had high expectations for the device. We had the privilege of obtaining a Bold on launch day, and we came away very impressed! Though it retains the curves that have come to define the latest BlackBerry devices, the Bold ushers in a refreshed design with a new exterior look and feel. Upon initial inspection, the most noticeable modification is the battery back, made of a leather-like material. Additional changes come in the chrome sides and black keypad/screen area, and the design elements all come together to create a very classy device that hockey Moms and business professionals will be sure to appreciate. The device is boxed with a USB cable, case, premium headphones, a home charger, and instruction manuals. Upon powering the device on, the first thing we noticed was the screen - and let us tell you - gorgeous is an understatement. Few phones that we have used match the screen that is found on the Bold. The keyboard resembles a mix between the Curve and 8800 series, and is quite easy to type on. An improvement can be found in the 'main' buttons; the send, home, back, and end keys are all much larger, thus reducing the chance of accidentally pushing the incorrect key. The unit is preloaded with OS 4.6.0.167, and invokes new features that we found useful. 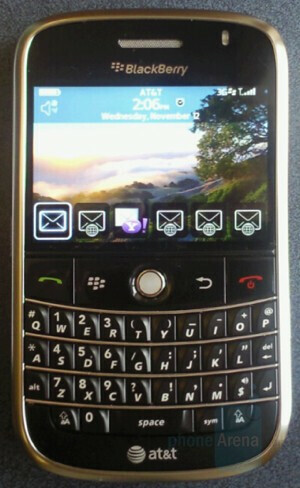 Gone are the days of the bland BlackBerry; the new operating system offers the ability to receive e-mails in HTML format. Finally, one can download images within their e-mail! Not to be forgotten, the HTML web browser is quite functional, and represents a shift for RIM. Operating on AT&T's 3G network, we found the browser to be an absolute pleasure to use, and fast to boot! Because of the size of the screen, zooming and a bit of scrolling may be required from time to time, however the advantage of an HTML browser on a 3G BlackBerry device outweighs the extra work. On the note of scrolling, the trackball on the Bold is different in the fact that it's not recessed into the device like previous BlackBerry's, thus making it a bit odd to get used to at first. The only minor frustration that we came across was the durability of the device. As we were getting into the car (four hours after receiving it, nonetheless), the phone accidentally slipped and (while in the case) fell onto the ground. Upon inspection, the minor drop did quite a bit of damage to the chrome sides. BlackBerry's have always been marketed as relatively durable devices, and small accidents such as this make us wonder what would happen if the phone suffered a serious fall. 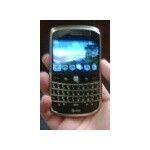 All in all, the device is a joy to use, and the 3G speeds are a welcome addition to the GSM BlackBerry arena. If you can look past the relatively high price tag, the benefits of this phone are fantastic. We look forward to spending more time with it! THIS PHONE IS GOING NO WHERE..THE STORM WILL TAKE THE SCENE WATCH!!! You don't work for VZW your a "wanna be" agent....probably a sub at that! Agreed. Too many Verizon fagboys lurking. 99% of the people braggin up the Storm haven't even touched it which makes their statements about it hilarious at best. Get a life you losers, and stick to threads about your own interests. it isnt going to be a bold vs storm battle, it will be an iphone vs storm battle, and you are seriously underestimating the iphone if you think the storm is gonna clean house like you say it will. IT WILL MURDER THE BOLD IN SELLS THATS ALL I KNOW!! The buttons are so so soft the screen is perfect the network is fast, this phone is the bomb like tic tic I absolutly LLLLOOVE IT!!!!! The best thing about the storm is that it happens to be a blackberry. Not because its on Verizon. All in all, you got your Apple junkies, and you got your Blackberry junkies. Everyone has their fruit. So enjoy it. Oh yeah the Bold is badass too. Lol. A BB Storm popped up. I think that the Storm and the Bold are in two different segments and will be marketed to two different type of people. I for one work for Verizon Wireless and I think the storm will be a great phone and maybe will be better than the bold but no one knows until the phone comes out. I have had a chance to play with the storm and it is a great phone ... but I agree that we need to comment on the phone and not the provider that is going to carry the device because each carrier has a key device that is a top seller among that carrier. i like how you guys are fighting about who's is best when the makers of both the bold and the storm are the same ppl. and you guys are acting like it's a big bad battle till the end on who's is the best. I mean hell i'm sure RIM is just sitting back proud of the work that they put into both i'm sure both devices will be equally enjoyable. So stop the bickering back and forth. Blackberry dont care if the bold outsells the storm or if the storm outsells the bold. They just want both to sell good. Its the carriers who care. Going from a 8830 to a Bold, I have to say that the Bold blows it out of the water. Did you hear that ATT is working on the tether option for the 3G iphone? Capping the WIFI hot-spots?